Your tour starts as you depart New Orleans by coach with a driver, who takes you out of the city and onto the Louisiana portion of the Great River Road, made up of many state and local roads that follow the Mississippi River all the way up to Minnesota. You'll visit two plantations, depending on the option selected when booking. You have three choices. Laura Plantation: The tour of this Louisiana Creole plantation is based on 5,000 pages of documents found in the French National Archives and in the memoir Memories of the Old Plantation Home, written by Laura Locoul Gore, which details 250 years of the people who lived and worked here. It's listed on the U.S. National Register of Historic Places. 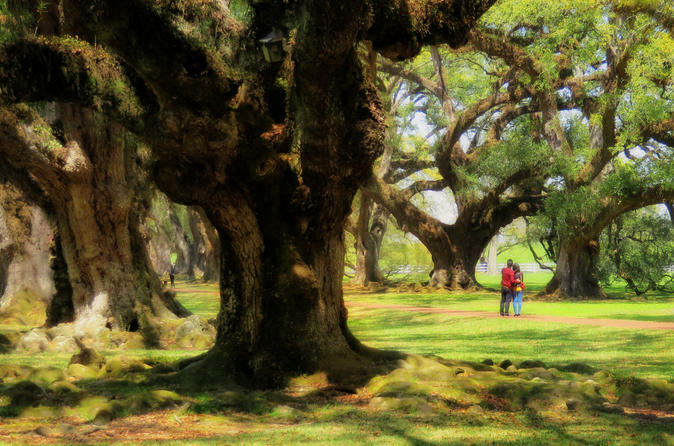 Oak Alley Plantation: Go back in time to 1839, when this plantation was built, and marvel at the long alley of 28 oak trees, each more than 250 years old, planted before the house was constructed. You can also check out the swampy area of cypress trees bordering the Mississippi River. Known for its Greek Revival architecture, this plantation is a U.S. National Historic Landmark. Whitney Plantation: Also listed on the U.S. National Register of Historic Places, Whitney Plantation opened its doors to the public in 2014 for the first time in its history, which dates back to 1803. The plantation opened as a museum dedicated to slavery in the South. At the end of your two visits, your tour ends with return to your departure point in New Orleans. Special Offer - Book by February 28, 2018 to save 23% off our previously offered price! - Book Now!